Posted on April 17, 2019 at 12:14 am. The rules set forth procedures and time frames for reporting and processing whistleblower complaints by employees against their employers and expand the instances in which an employee can sue their employer for retaliation under the ACA. Posted on January 8, 2019 at 5:57 pm. In recent years, many companies have been dealing with rising health care costs largely by transferring more of the expense and risk on to their employees. Pharmacy benefit managers. Pharmacy benefit managers are independent third party administrators who work with pharmacists, employers and workers to reduce costs and inefficiencies. For example, they may help workers migrate from expensive brand name drugs to equally effective generics for a fraction of the cost. Or they may be able to migrate workers from bricks-and-mortar pharmacies to mail order. They also assist employers with contract negotiations. Telemedicine. Some companies are contracting with doctors to provide health services online, via a video feed. It’s no substitute for an in-person examination, but workers can get consultations and routine assessments done and get a prescription for a fraction of the cost of an in-person visit. Furthermore, the worker doesn’t have to take time off work for an appointment. It can be done from the office. A typical insurance billing for a basic medical appointment can run as high as $150. But a telemedicine visit can cost about a third of that amount, according to reporting from U.S. News. Wellness programs. Healthy employees cost much less than sick ones over time. Smokers and the obese generate much more frequent and higher medical claims than normal-weight employees. Employers are fighting back by offering access to smoking cessation and weight loss programs, as well as additional programs for the management of common conditions such as high blood pressure, diabetes and asthma. About 58% of health plans nationwide offer an incentive for participating in a wellness program, according to research from CEB, the best-practice insight and technology company. Consumer-directed health plans. Employers are also giving employees greater control over their spending decisions. They are doing this via high-deductible health plans, which come with access to health savings accounts. These allow either an employee or an employer to contribute pre-tax dollars to an HSA. Withdrawals from an HSA to pay for qualified health care expenses are tax-free. These plans are less expensive for employers than comparable traditional insurance plans, and can work very well for employees in good health. Some employers choose to contribute to HSAs on their workers’ behalf. Transparency tools. Cost-transparency tools make the cost of every medical procedure or service visible to employers and patients alike. A claims analysis from UnitedHealthCare found that those who used the company’s transparency tools spent an average of 36% less on health services. When consumers used price-transparency tools, CEB researchers found an average saving of $173 for employees and $409 for employers per procedure. Posted on November 28, 2018 at 3:36 pm. As the number of employers offering high-deductible health plans continues growing, the spotlight recently has highlighted an inconvenient truth: some employees are going broke and filing bankruptcy because they cannot afford all of the out-of-pocket expenses and deductibles they must pay in these plans – just like the bad old days in the 1990s and 2000s. Besides being in plans with high deductibles, many employees are also paying more for coverage as employers have shifted more and more of the premium burden to their staff. Making matters worse, studies are showing that many people with HDHPs are forgoing necessary treatment and not taking the recommended dosages of medicines because they can’t afford the extra costs. Enrollment in HDHP plans grew to 21.8 million in 2017, up from 20.2 million the year prior, and 5.4 million in 2007, according to a report by America’s Health Insurance Plans. Nearly 40% of large employers offered only high-deductible plans in 2018, up from 7% in 2009, according to a survey by the National Business Group on Health. 50% of all workers had health insurance with a deductible of at least $1,000 for an individual in 2018, up from 22% in 2009, according to the Kaiser Family Foundation. Despite that, a 2017 report by the Centers for Disease Control and Prevention found that 15.4% of adults in HDHPs in 2016 had issues paying bills, compared to 9% of those with other types of insurance. 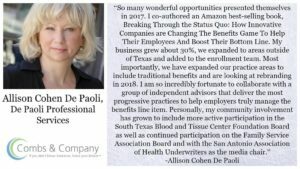 And there have been a number of news reports about the deep financial toll on HDHP enrollees that have suddenly been hit by serious maladies. Meanwhile, the average deductible for a family had risen to an average of $4,500 in 2017 from $3,500 in 2006, according to the Kaiser-HRET 2017 survey of employer-sponsored health plans. As a result, some employers are rethinking their use of these HDHPs and trying to reduce the burden on their workers, according to news reports. Studies show that many put off routine care or skip medication to save money. That can mean illnesses that might have been caught early can go undiagnosed, becoming potentially life-threatening and enormously costly for the medical system. Findings: When one large employer switched all its employees to high-deductible plans, medical spending dropped by about 13%. That was not because the workers were shopping around for less expensive treatments, but rather because they had reduced the amount of medical care they used, including preventative care. The study found that women in HDHPs were more likely to delay follow-up tests after mammograms, including imaging, biopsies and early-stage diagnoses that could detect tumors when they’re easiest to treat. Findings: People with HDHPs but no health savings accounts are less likely to see primary care physicians, receive preventive care or seek subspecialty services. Compared to individuals with no deductibles, those enrolled in HDHPs without HSAs were 7% less likely to be screened for breast cancer and 4% less likely to be screened for hypertension, and had 8% lower rates of flu vaccination. The study authors noted that although more individuals have health insurance under the Affordable Care Act, premiums and deductibles have increased, leaving many Americans unable to afford these costs. Oddly, many people in HDHPs are also forgoing preventative care services, even though they are exempted from out-of-pocket charges, including the deductible under the ACA. This is likely because most people don’t know that the ACA covers preventive care office visits, screening tests, immunizations and counseling with no out-of-pocket charges. As a result, they do not benefit from preventive care services and recommendations. A few large employers – including JPMorgan Chase & Co. and CVS Health Corp. – recently announced that they would reduce deductibles in the health plans they offer their employees or cover more care before workers are exposed to costs. CVS Pharmacy, part of CVS Health Corp., in 2013 had moved all of its 200,000 employees and families into HDHPs. During routine questionnaires, CVS later found that that some of its employees had stopped taking their medications because of costs. The company, in response, expanded the list of generic drugs its employees could buy for free to include some brand name medications, as well as insulins. Posted on November 13, 2018 at 6:41 pm. The IRS has released the inflation-adjusted amounts for 2019 used to determine whether employer-sponsored coverage is “affordable” for purposes of the Affordable Care Act’s employer shared responsibility provisions. For plan years beginning in 2019, the affordability percentage has increased to 9.86% (from 9.56% in 2018) of an employee’s household income or wages stated on their W-2 form. The higher rate is indicative of the anticipated small group plan inflation that continues hitting premiums. If you are an applicable large employer under the ACA (with 50 or more full-time staff), you should examine the affordability percentages for your lower-waged employees so you don’t run afoul of the law. Fortunately, as the percentage has increased, you’ll have more flexibility when setting your employees’ contribution rates. A recent study by PricewaterhouseCooper’s Health Research Institute found that employers and insurers are expecting a 6% increase in health care costs in 2019. While that rate is just slightly above the average 5.6% increases since the ACA took effect, many employers have increasingly been passing the inflationary costs on to their covered employees. The report by PwC noted three trends that are having the largest effect on health care costs. Abundance of treatment options – With covered individuals demanding more convenience in their treatment options, employers and health plans have responded by giving them more ways to obtain care, like retail clinics, urgent care clinics and electronic physician consultations. While the long-term goal is to reduce health care spending on services, currently the increased offerings have resulted in higher utilization. Mergers by providers – Hospitals and other health care providers have been consolidating for the better part of a decade, and that trend is expected to continue in light of several recently announced mega-deals. Prices tend to rise when two health systems merge and the consolidated entity gains market share and negotiating power. Physician consolidation and employment – Hospitals, health systems and medical groups are hiring more and more doctors out of private practice. And when that happens, costs tend to go up since these organizations tend to charge higher prices than independent practitioners. In 2016, 42% of physicians were employed by hospitals, compared to just 25% in 2012, according to the PwC report. Hospitals and medical groups tend to charge between 14% and 30% more than physicians in private practice. Expectations that next year’s flu will be milder than this year’s main virus. More employers are offering care advocates who help covered individuals navigate the insurance system to find the best quality care at the best price. According to the survey, 72% of employers offered health-advocacy services to their employees in 2018. More employers are using “high-performance networks,” also known as “narrow networks.” In essence, a plan will use a narrow network of doctors who care for the bulk of covered individuals. Not contracting with as many doctors means lower overall outlays for medical services. While the doctors in these networks are not always the least expensive providers, they typically are ones who have proven over time to yield the best results. We are here to help you get the most value for your and your employees’ health care spend. Talk to us about any of the tools mentioned above to see if we have a program that might work for your organization. Posted on November 7, 2018 at 6:01 pm. If you don’t know Barry Moltz of Business Insanity podcast – you need to get him on your radar. He is a wonderful host who is enthusiastic about introducing you to the people and ideas that can improve your life. On this episode, we talk about control and predictability to provide benefits, offer quality access to care and reduce costs. This podcast is special for me because I’m extremely passionate about changing the way employers access and pay for healthcare. Listen to segment 2 (about 20 minutes into the podcast) and let me know your feedback! I’m all ears. 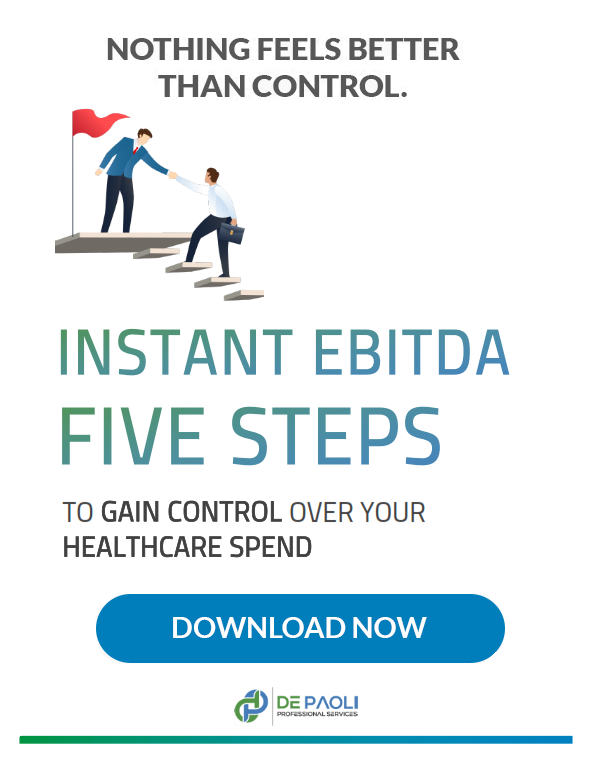 Are you ready to gain control over your healthcare spend? Did you want to learn how to make a healthcare plan predictable and repeatable? Pharmacy Benefit Managers: A Break On Rising Prescription Costs Or a Cause of Them? Posted on November 6, 2018 at 10:36 am. In 2015, spending on prescription drugs grew 9%, faster than any other category of healthcare spending, according to the U.S. Centers for Medicare and Medicaid Services. The report cited increased use of new medicines, price increases for existing ones, and more spending on generic drugs as the reasons for this growth. Increasingly, though, observers of the healthcare system point to one player – pharmacy benefit managers. A PBM typically has contracts with both insurers and pharmacies. It charges health plans fees for administering their prescription drug claims. It also negotiates the amounts that plans pay for each of the drugs. It can do this because the health plan does not know what the PBM’s arrangement is with the pharmacy and vice versa. Also, one health plan does not know the details of the PBM’s arrangements with its competitors. A PBM could charge one plan $200 for a month’s supply of an antidepressant, charge another plan $190 for the same drug, and sell it to a pharmacy for $170. None of the three parties know what the other parties are paying or receiving. In theory, the PBM’s pass these rebates back to the health plans, who use them to moderate premium increases. However, because these arrangements are also confidential, the extent to which these savings are passed back to health plans is unknown. Many observers believe that PBM’s are keeping all or most of the rebates. To fund the rebates, drug manufacturers may increase their prices. The CEO of drug maker Mylan testified before Congress in 2016 that more than half the $600 price of an anti-allergy drug used in emergencies went to intermediaries. The PBM’s argue that they help hold down drug prices by promoting the use of generic drugs and by passing on the savings from rebates to health plans and consumers. They reject the notion that they are somehow taking advantage of health plans and pharmacies, pointing out that they are “sophisticated buyers” of their services. They also argue that revealing the details of their contracts would harm their abilities to compete and keep prices low. Nevertheless, PBM’s are now attracting scrutiny from Congress, health plans and employers. At least one major insurer has sued its PBM for allegedly failing to negotiate new pricing concessions in good faith. In addition, businesses such as Amazon are considering getting into the PBM business. Walmart is already selling vials of insulin at relatively inexpensive prices. PBM’s earn billions of dollars in profits each year. With the increased attention those profits have brought, it is uncertain how long that will continue. Posted on March 14, 2018 at 9:07 pm. Susan Comb’s recently featured me in her “What’s the Good News, Ladies” column for BenefitsPRO magazine. I am in great company this month – Paula Beersdorf and Cerrina Jensen have great things going on also. It is easy to forget all the good things that have happened in the past year! So much has happened and we are just getting started, look out 2018!! Posted on March 3, 2018 at 1:05 am. I was recently invited to the Workplace Benefits Renaissance Conference in Atlantic City NJ to speak on one of the Increasing Sales Revenue track – Optimizing Enrollment & Improving Employee Engagement. 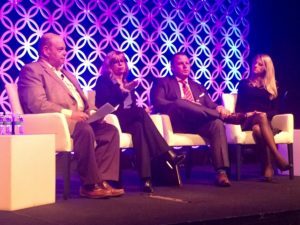 The whole panel – moderator Ron Kleiman and fellow panelists Rachel Pennington and Adam Maggio – gave diverse views about how to effectively deliver value to the employer, the employee and grow their business. Here is my take featured in EBA magazine. Posted on January 14, 2018 at 5:01 pm. It was such a pleasure to sponsor Adam L Hamilton, PE, the new President and CEO of Southwest Research Institute. 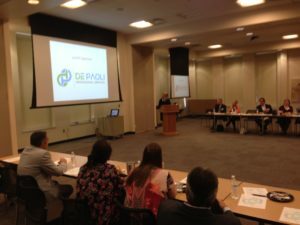 He spoke at the October 25 Healthcare Think Tank luncheon. We talked about the stars, the oceans and everything in between.. even healthcare! We are incredibly fortunate to have SWI here is San Antonio! !